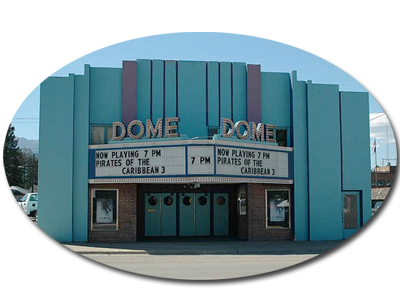 Originally built in 1910, the Dome Theater in Libby, Montana has been the one and only staple of movie and live entertainment in Northwest Montana for many residents and tourists alike. To this day we still show Hollywood's latest feature films, modern movies, local and international productions shown on our new projector plus we host live theater productions for both local artists and traveling theater companies. The Dome's 300+ seating capacity combined with the newly installed surround sound experience is perfect for new movies, concerts and live theater while still being available to a local event such as a wedding or birthday celebration. Our concession stands feature a variety of treats from classic soda fountains, traditional movie theater popcorn and the seasonal Montana treats that have made this area famous such as Huckleberry flavored delicacies! Learn more about the Libby Dome Theater here! The Dome Theater now has new opportunities to advertise to a diverse range of potential customers. Contact us today to learn how advertising at the Dome Theater can help grow your business!